The surest barometer of a man’s style is his shoes. Any investment of time, money, and care taken in dressing the body is squandered by the man who neglects his feet. Quality dress shoes start around $300, and they are well worth it. They are incredibly comfortable, even when new, and will last twenty years if properly cared for. Unlike suits and ties, a man rarely risks appearing overdressed in fine shoes, so they offer today’s man a way to bring class to his weekend attire without drawing snide comments from t-shirted friends and family. If you are still smarting from the thought of spending $300 on a pair of shoes, consider this: department store dress shoes consisting of cheap leather glued to rubber soles cost at least $100, and can generally be expected to last two years at most. At this point, the leather develops notable signs of fatigue, and the soles crack or wear thin. Repairing often costs as much as a new pair. On the other hand, the $300 shoes, made of good leather stitched to leather soles, will last decades. Depending on how you walk, they may need resoling every few years, at a cost of about $60. 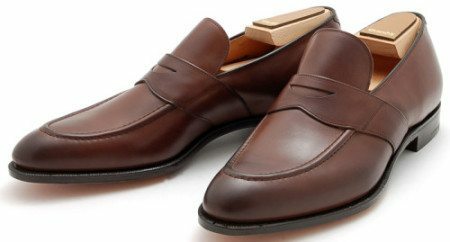 Quality shoe leather actually improves with age, as it develops a deep, rich shine from years of polish. Thus, $300 shoes are an investment that will pay dividends long after their cost is forgotten, along with most anything else a man could have spent his money on. As a general rule, good men’s shoes are made by companies whose primary business is the manufacture of men’s shoes: Allen-Edmonds, Alden, John Lobb, Church’s, and Crockett & Jones are all excellent choices. 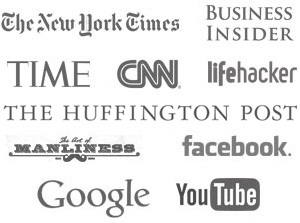 If you have not heard of some or all of these companies, it is because they spend their customers’ money on quality materials and skilled craftsmen, rather than extensive advertising campaigns. Their shoes sell themselves. On the other hand, the shoes sold by high-end fashion labels are often made by third-party manufacturers using cheap materials and shoddy construction, and are little better than department store shoes, whatever their price tag. Once you have invested in a decent pair of shoes, you must care for them properly if you wish for them to last. When you buy them, also buy a pair of cedar shoe trees. These spring-loaded contraptions fit into your shoes when you take them off, returning the shoes to their original shape and absorbing moisture and odor. 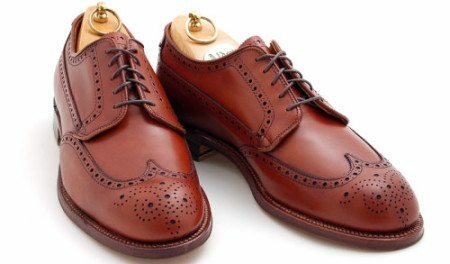 Ideally, the shoe trees should be left in for twenty-four hours after each wearing, which means owning at least two pairs of shoes. If you can only afford to buy one pair when starting out, at least having the shoe trees in overnight will help the shoes stand up to constant wear until you can afford to bring in reinforcements. When putting shoes on, always use a shoe horn, to prevent creasing the leather around the heel. Finally, good shoes require polish. Unpolished leather looks sloppy and immature, and will also fray and crack. It takes only ten or fifteen minutes to clean and polish a pair of shoes once every half-dozen wearings, and less than sixty seconds each morning to brush the dirt out of the cracks and run a rag across the tops. Polish them with the trees in, first cleaning the leather with Kiwi Saddle Soap or some similar leather cleaner. This prevents layers of polish from accumulating into gunk, and also helps to preserve the leather. If you would like to purchase any of these shoes, please contact the fine Gentlemen at Leffot in NYC. These photos are from their amazing blog.